We’re in a time when writers carry a heavy responsibility. They produce the fuel — SEO-ready content — that marketing engines need to drive sales forward. Content marketing requires a LOT of content. 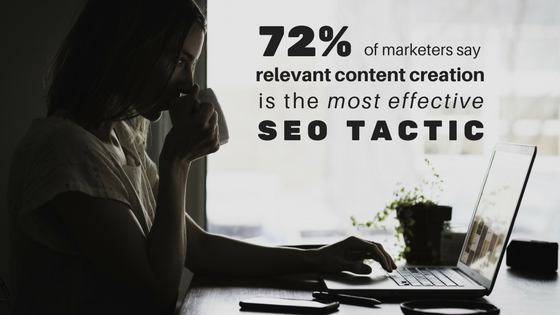 In fact, 72% of marketers surveyed said relevant content creation is the most effective SEO tactic. It makes sense, then, that writers should be equipped with tools that help them make informed SEO decisions along the way to making relevant, optimized content. Admittedly, this led to the WordPress SEO plugin that we developed and announced last October. After all, if you predict something you should also act on it! What a plugin like Bruce Clay SEO for WordPress does is give writers and publishers a tool to create targeted content that is reasonably search engine optimized. Writers are empowered with website and web page analytics data in a familiar environment in a user-friendly UX. Writers get competitive analysis of the targets they are aiming to outrank with their own content. And writers get all this at the point of publishing allowing for streamlined analysis within the World Wide Web’s most popular publishing platform. Marketers are increasingly turning to content as a way to market to ad-averse digital natives. As a result, the amount of content available on every topic possible has grown exponentially. Content works at every stage of the customer journey from brand awareness to lead generation. And everyone knows that content is needed to be in business today. This has led to content burnout. It’s obvious that today’s best writers have a growing need for SEO skills to help them analyze data and decide what content needs creating. Content burnout or overload has happened as so many topics have been covered in-depth online. Original content is harder to produce because so much has already been written on so many topics. Targeted content is in some ways easier to produce because of the amount of tools available and the lower volume of existing content online, but to produce both original and targeted content is still difficult. Is Too Much Content a Bad Thing? This content economy has positive implications for SEO. The more quality content you have on a site covering one particular topic, the more likely you are to rank high on search engine results pages (SERPs). We believe that authors need SEO to become first among equals. Creating a massive amount of quality SEO content makes it hard for the competition to keep up. As long as your body of quality content is continually increasing, companies with smaller budgets or that begin producing later will find it difficult to ever catch up to your site in terms of domain authority. But if you are new to the web, not all is lost. What helps new bloggers is that even though much content exists online, most of it never gets any attention. 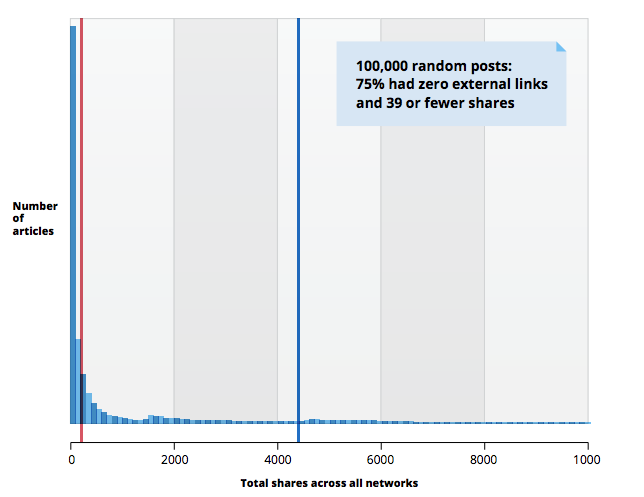 In a study of a million articles, 75% of 100,000 randomly selected pieces had no external links and fewer than 39 shares. A 2015 study by BuzzSumo and Moz analyzed the shares and links of over 1 million articles to see the format of content that get relatively more shares or links. We believe that writers who are able to produce great written content with search marketing value have a huge advantage. By properly optimizing their content for search, writers are gradually adding SEO to their normal content-focused duties. At one point, 85% of B2B marketers reported they couldn’t connect their content marketing activity to business value. This led to a number of reputable organizations making it a priority to determine what the ROI of content marketing was, and what it should be. Content marketing brings in 3x leads per dollar spent vs. traditional outbound marketing. Companies with blogs produce an average of 67% more leads per month. Even with all the information about content marketing ROI, only 21% of content marketers say they are successful at tracking content ROI. Understanding the ROI of SEO has additional challenges because there are a number of ways SEO affects revenue, and a number of ways to “do” SEO. We believe it is vital to provide authors with feedback on their work — traffic, time on page and bounce rate — in order to increase quality and SEO awareness. Additionally, ROI from an SEO campaign often extends well after the campaign is over, making it even harder to track. Years ago, a study showed 43% of marketers couldn’t measure the ROI of their SEO. Imagine if every writer had access to data to see how popular their articles are and how much new traffic their content is bringing to a business! As a writer, having access to the tools that show you how you’re performing provides focus and direction when deciding what pieces to create next to contribute to business objectives. The content marketing industry is becoming more data-driven as it matures. This means leading writers have adapted by becoming more technically savvy, using tools that provide data to justify why a particular piece of content is needed, as well as tools to show how it’s performing after publishing. Only the last step has anything to do with the creation process; all of these SEO suggestions take place before the first word is written. As a result you would almost never find a content writer job description without SEO as a need-to-know skill. As our dependence on data increases, writers need to continue to access as many data sources as possible to create new SEO content. Not only do writers need to know where to find data, they also need to understand how to use this data to create meaningful content that resonates with their target audience. Writing quality content may not be enough. The tie breaker we see over and over is a deftly search-optimized page. Tools have evolved to allow writers unprecedented access to data, yet there’s still plenty of room for improvement, especially in the area of SEO content tools. Hunting for data on multiple websites, scouring through months of Google Analytics data and typing queries into Google itself eats up precious time that could be spent creating content that’s going to bring more traffic and revenue to a site. WordPress, the world’s most popular content management system, boasts over 50,000 plugins. But with all its flexibility and power, the platform is still lacking. WordPress is a content management system and not an SEO tool. Let me repeat that. WordPress is obviously about content management and not SEO. 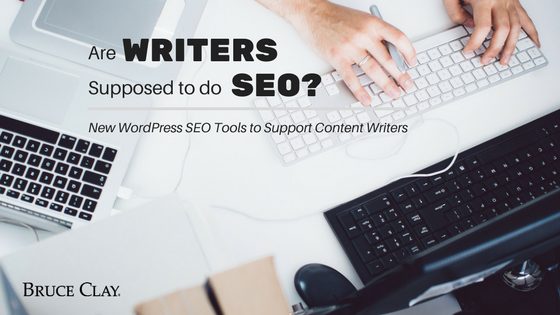 Many of the tools added to the WordPress platform are not adequate for a writer taking SEO initiative. Most data is not in one place and is not readily available to an author or publisher. If these tools were condensed into a single place within WordPress, then more writers would create quality content that is highly-targeted and data-driven. Because the tools and processes are scattered and time-pressed writers don’t often have the time to go to multiple websites to gather all the information, SEO success may suffer. It’s obvious that today’s best writers have a growing need for SEO skills to help them analyze data and decide what content needs creating. In fact, it is a very big part of every writer’s job already and will become even more so in the future. But hunting for data on multiple websites, scouring through months of Google Analytics data and typing queries into Google itself eats up precious time that could be spent creating content that’s going to bring more traffic and revenue to a site. The solution is to bring data to writers in the content publishing environment. Adding SEO into the publishing workflow is the surest way to improve the distribution and visibility of labor-intensive content investments — that’s why we’ve been working hard to finish our coming Bruce Clay SEO plugin and bring it to the WordPress community. If you’re looking for a solution that will quickly provide insights to writers and publishers looking to get answers without going through half the internet to find them, sign up for the early preview release of our SEO plugin for WordPress. It will give you answers to your most pressing SEO needs within WordPress, saving hours of frustration. If you like this post, please share it with your friends or colleagues. For more like this, subscribe to our blog. I work in SEO and as a writer myself. It might seem that SEO is not necessary for writers but by knowing SEO the writer starts to understand better what kind of content is needed. Plus knowing new skills are always good. It is not the writers job to do Seo. But most of them are trying very hard to do it their own way. So, this resource that you had shared with us is very fine for someone who has never been in this field. But in my suggestion if you have a blog than you must know something about SEO. Hello Bruce, is there any difference between your SEO plugin and the WordPress SEO plugin by Yoast? Hi Bruce, I think knowledge of SEO tools are very crucial to all writers nowadays. Handwritten Content are helpful for better search engine ranking. Camelia: We’re happy to hear you’re reading and getting a lot out of our blog. Don’t forget to subscribe if you’d like new posts by email! Thanks for your comments. Nice SEO tools to write high quality, unique content for your website. Hi, Writers can use couple of content checking tool to avoid duplicate content issue. Thanks for sharing. I think SEO will always be necessary. The tools and plugin in WordPress have just made it much more simple and straightforward. I feel alot of small business websites can post too much content i.e. blogs everyday. 3SMarketers: Awesome to hear that. Thanks for reading! Ben: SEO knowledge and tools are exactly what content/blog writers require today, and it sounds like your situation is ideal! It’s especially gratifying to know how important your role is and be duly valued. I actually am a writer that is required to do SEO! My company hired me onto the digital marketing team in light of my blog and content writing skills, and are now training me in SEO, SEM, and digital marketing tactics. I can’t help but feel like a critical piece of my organization’s arsenal; not only am I able to research keywords and interpret data to determine topics and demographics; but I’m able to produce the content needed as well. I believe that all writers–be they blog writers. copy writers, what have you–should all be trained somewhat in SEO and SEM tactics, software, and plugins. It really makes all the difference for the organization, and for the individual by providing them with a diverse and effective skill set for the digital marketing field.